In the present chapter we set out a general approach to stability analysis problem for a set of trajectories of difference equations with uncertain parameter values. 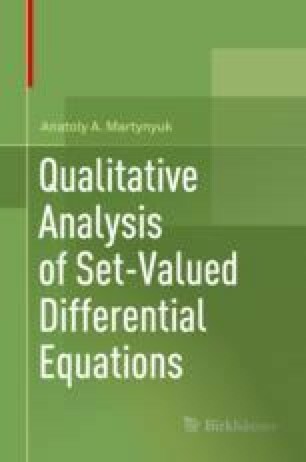 For the set of difference equations generated by discretization of the set of differential equations with Hukuhara derivative a principle of comparison with matrix Lyapunov function is specified and sufficient stability conditions of certain type are established. The analysis is carried out in terms of a matrix Lyapunov function of special structure. For an essentially nonlinear multiconnected switched difference system, conditions are obtained providing the asymptotic stability of its zero solution for any switching law. An example is presented to demonstrate efficiency of the proposed approaches.